With drive-in racking, pallets are stored in the system on continuous heavy duty rails allowing pallets to be stored as deep as you wish. Loading and unloading of the system must take place from the top to the bottom (or other way around). To load the pallets the trucks can drive into the racking lanes. 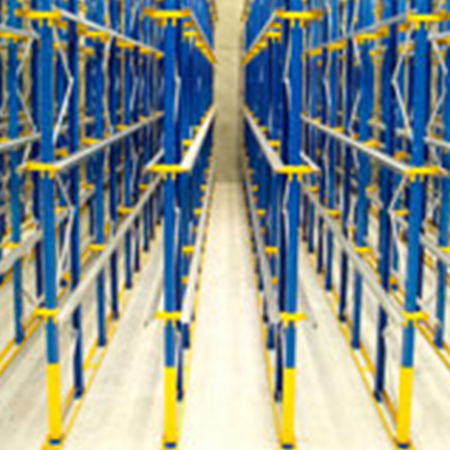 With drive-in racking, rack servicing is only possible from one side (LIFO method). With drive-through racking in contrast, depositing can be carried out from one side and at the same time retrieval from the other side (FIFO method). Compared with drive-in racking, throughput is therefore higher with drive- through racking. Drive-in and drive-through racking is ideally suitable for storing large quantities of goods with a low number of different articles. The racking system combines the advantages of block stacking and rack stacking: compact space utilization at height and careful storage of goods. Before entering the aisle, the truck lifts the pallet to the required racking level. The truck must not be wider than the pallet. Sideways seat stackers are particularly suitable as they provide the operator with unobstructed visibility also during reverse travel.